Before there was a Secometer, there was the Secometer, but there was never a Sectometer. If you've been around vintage Hamilton watches for long, you probably know there were several Secometer models, starting in 1946 but there is also a B and a C model too. 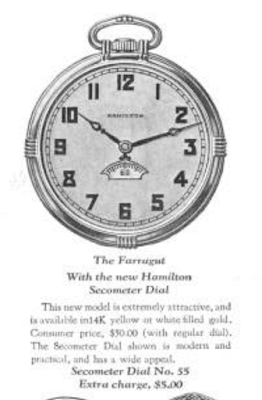 However, in 1930 Hamilton introduced a new dial option for 12-size pocket watches called the Secometer. 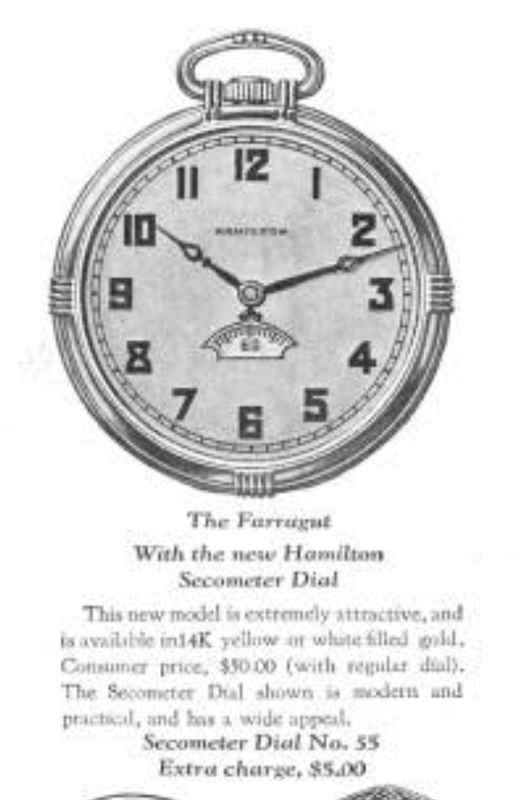 It featured a small window in the dial through which you could see a small wheel with the seconds printed rotating. 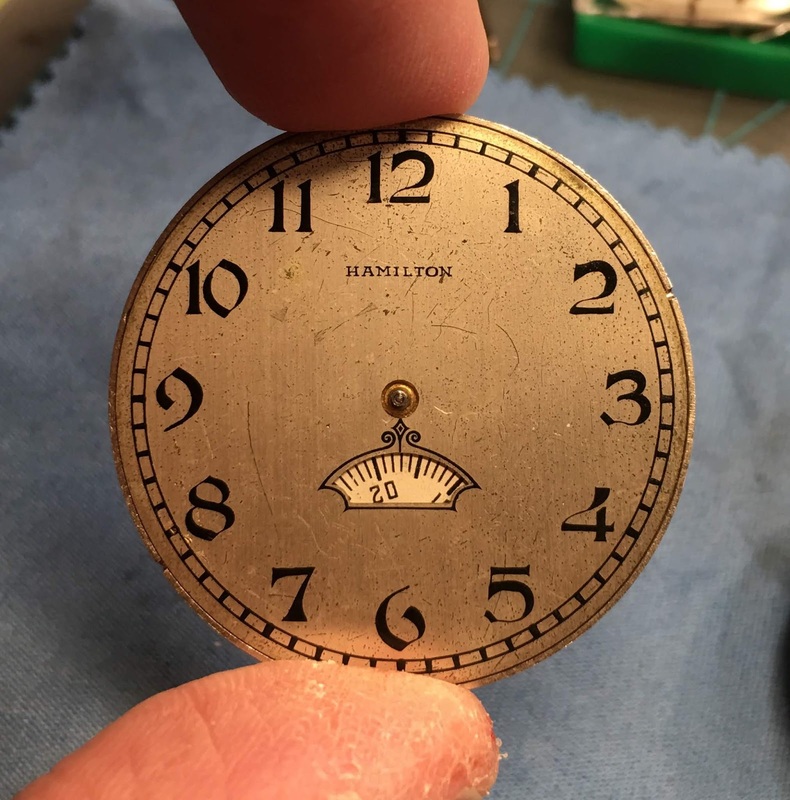 The Secometer dial was an option for all of the 12 size pocket watches starting in 1930 and there are several dial patterns in the Secometer line, including with applied gold numerals. 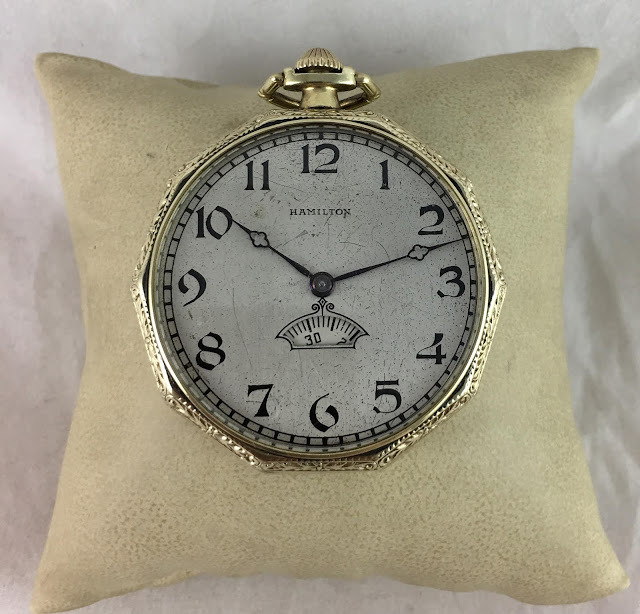 I have found that pocket watches with Secometer dials are very popular and I have never been able to score an example because someone always outbids me. However, I recently landed an uncased example from somewhere in Eastern Europe, of all places. This example came on a 12 size 912 movement. 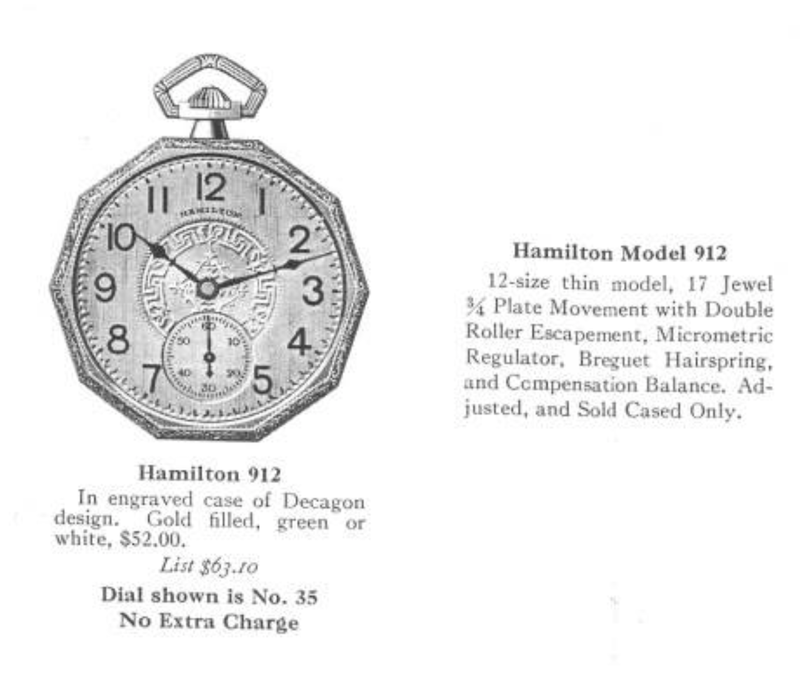 The 912 is an entry level pocket watch and extremely common. 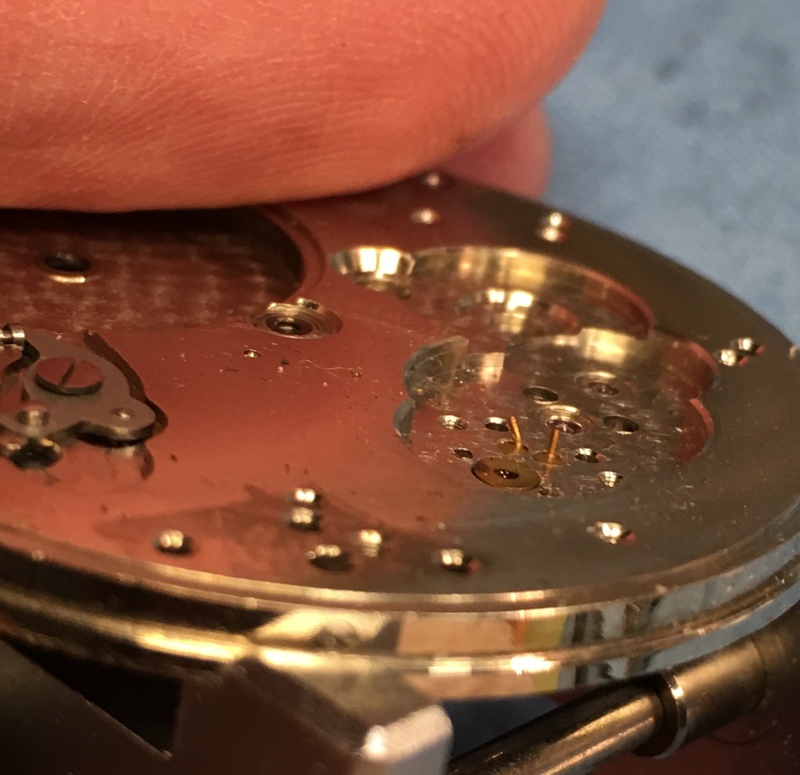 It shares a lot of parts with the more expensive 12 size watches though so they make good donor movements. Although this watch was sold "as running" it didn't arrive as such. The balance staff isn't broken though so I'm not sure what's up with it. With the dial out of the way, you can see the seconds wheel that is pushed onto the 4th wheel pivot. I'm not sure how to get the wheel off so I'll just pull the 4th wheel out from the other side as I take apart the movement. That way I can use the main plate to put even pressure on the wheel and not bend the pivot. 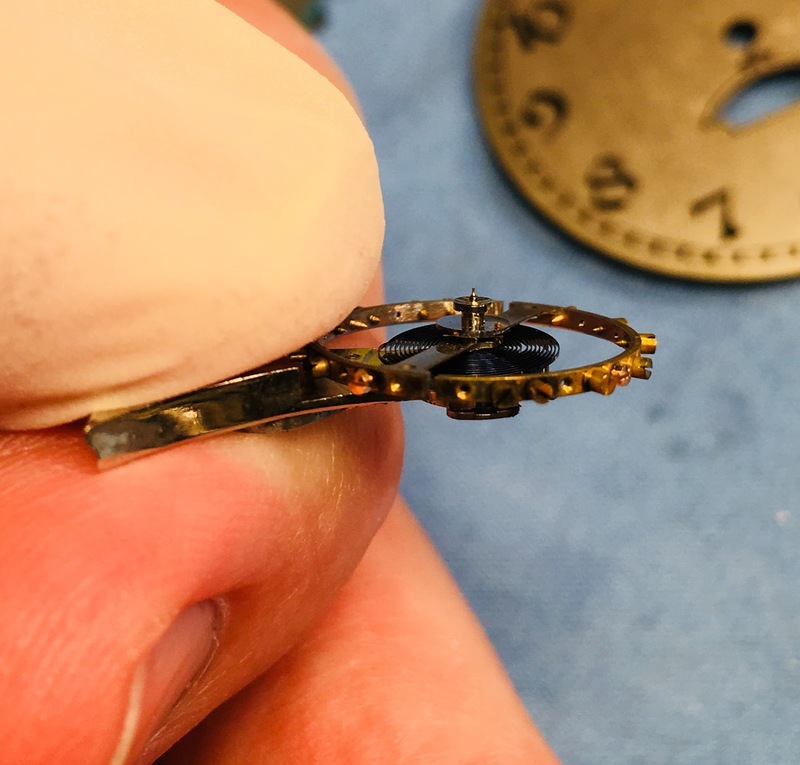 You can see in the photo below that the 4th wheel for the Secometer dial requires a slightly modified 4th wheel and the pivot or seconds bit is shorter than a conventional movement. One of the banking pins it severely bent. Hopefully I can straighten it without breaking it off. 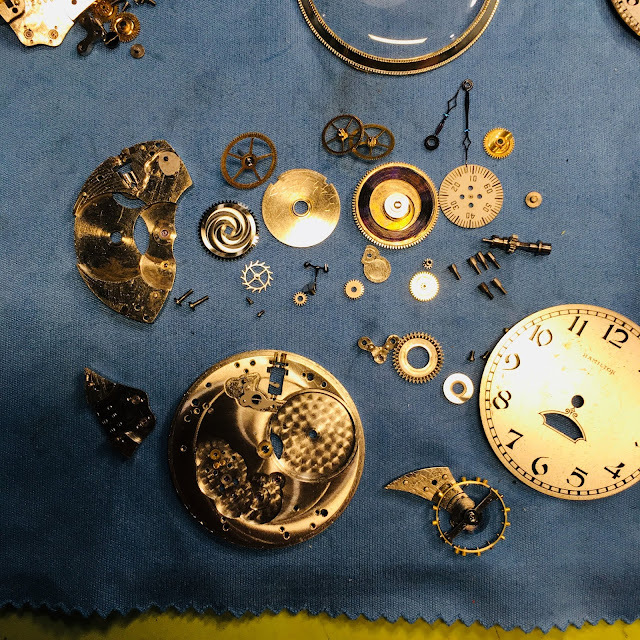 Well, I can see why the watch isn't running, the impulse jewel, aka roller jewel, is missing from the balance. So there is nothing to engage the pallet fork. There's just a small nub of jewel and I suspect that whatever bent the banking pin must have also broken the jewel off. Oh well, I have another balance to use. The reassembled movement is running a little fast but I can slow it down without too much difficulty. There... everything is looking great now. My donor movement came in a slightly earlier 1920's Decagon case in green gold filled. Well, I can see why Secometer models are so popular. This is a really cool looking pocket watch. Considering the small wheel under the dial is so unimpressive, it's completely different when a portion of it is displayed through the decorative window. And in the video below you can see it in action. Why do you think the banking pin was bent? I’m guessing a person did it? Good question. The apparently broken impulse jewel could be related. Maybe someone or something forced the balance to rotate hard enough to move the pallet fork with enough force that the banking pin bent and the impulse jewel broke at the same time. 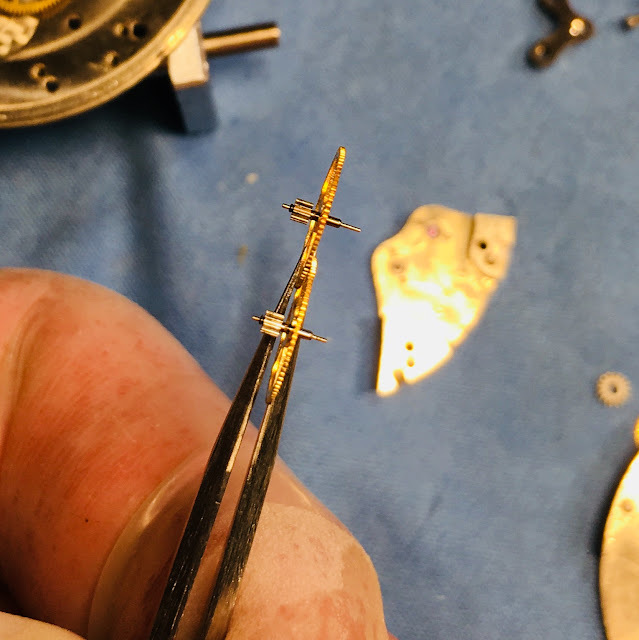 However, typically the impulse jewel passes through the pallet fork without binding so I suspect someone did it - either purposefully or accidentally.